the names of two rocks between Italy and Sicily, and only a short distance from one another. In the midst of the one of these rocks which was nearest to Italy, there dwelt, according to Homer, Scylla, a daughter of Crataeis, a fearful monster, barking like a dog, with twelve feet, six long necks and mouths, each of which contained three rows of sharp teeth. The opposite rock, which was much lower, contained an immense fig-tree, under which there dwelt Charybdis, who thrice every day swallowed down the waters of the sea, and thrice threw them up again : both were formidable to the ships which had to pass between them (Hom. Od.xii. 73, &c., 235, &c.). 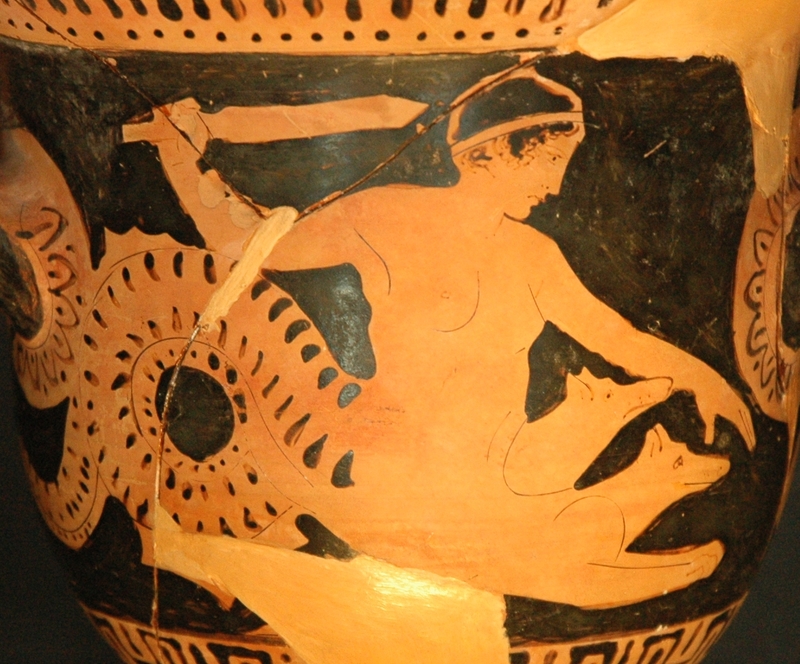 Later traditions represent Scylla as a daughter of Phorcys or Phorbas, by Hecate Crataeis (Apollon. Rhod. iv. 828, &c., with the Scholiast), or by Lamia; while others make her a daughter of Triton, or Poseidon and Crataeis (Eustath.ad Hom. 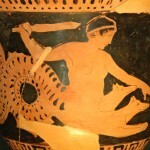 p. 1714), or of Typhon and Echidna (Hygin. Fab. praef.). Some, again, describe her as a monster with six heads of different animals, or with only three heads (Tzetz. ad Lycoph. 650 ; Eustath. l. c.). Charybdis was described as a whirl pool. caught like a hapless seaman between Scylla and Charybdis.